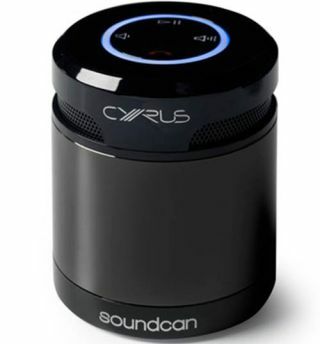 Cyrus Soundcan portable Bluetooth speaker now on sale | What Hi-Fi? It's often fairly tricky to get too excited about sub-£100 portable wireless speakers; a knockdown price and portable design doesn't tend to equal particularly great sound, even if there are of course plenty of benefits. The Cyrus Soundcan could be the exception. It's the company's "first piece of portable hi-fi equipment" and also a pretty big departure for Cyrus when it comes to price. With Cyrus saying it has been "tuned by the team behind the rest of our award-winning hi-fi products", we're certainly intrigued to see if it can raise the bar for Bluetooth speakers. Promising high quality music on the go, it has a battery life that's good for 10 hours of use and claims a 10m range of connection from a Bluetooth laptop, phone or tablet. It can also work as a speakerphone for hands-free voice calls. Standing 70mm tall and weighing 227g, the Cyrus Soundcan also has a 3.5mm auxiliary input for connecting non-Bluetooth devices. The Soundcan is on sale on the Cyrus Audio website, alongside the new Cyrus Lyric streaming systems, and is yours for £80.